The story in Euphoria was inspired by events in the life of anthropologist Margaret Mead. Most of the story takes place on the Sepik River in the Territory of New Guinea in the early 1930s. I found it fascinating to read about the lives of the three anthropologists in the story, as well as the cultures of the tribes they were living with. Although this story is mostly about the love triangle that exists between the three anthropologists, it is so richly enhanced by the exotic setting and people in which they are submerged. For me, this is what makes the book so captivating. Nell is a dedicated American anthropologist who is passionate about her work. She believes in it and takes it very seriously. At the heart of her drive is her desire to find the ideal society. Who are we and where are we going? Why are we, with all our “progress”, so limited in understanding & sympathy & the ability to give each other real freedom? Why with our emphasis on the individual are we still so blinded by the urge to conform?… I think above all else it is freedom I search for in my work, in these far-flung places, to find a group of people who give each other the room to be in whatever way they need to be. And maybe I will never find it all in one culture but maybe I can find parts of it in several cultures, maybe I can piece it together like a mosaic and unveil it to the world. The story begins with Nell and Fen leaving the Mumbanyo tribe. Because of the violence prevalent in their culture, Nell was anxious to leave, while Fen was strangely reluctant. Right away we see there is a rift in their marriage. Fen is envious of Nell’s success, creating constant tension and an unsupportive environment between the two of them. This feeling is amplified when Bankson enters the picture. Bankson has been alone with the Kiona tribe for almost two years. For the last while he has been doubting the meaning of his work and feeling suicidal. I asked her if she believed you could ever truly understand another culture. I told her the longer I stayed, the more asinine the attempt seemed, and that what I’d become more interested in is how we believed we could be objective in any way at all, we who each came in with our own personal definitions of kindness, strength, masculinity, femininity, God, civilization, right and wrong. When only one person is the expert on a particular people, do we learn more about the people or the anthropologist when we read the analysis? The arrival of Nell and Fen pulls him out of his slump and gives him company to look forward to. The location of Nell and Fen’s new tribe, the Tam, becomes the setting for the devastating love triangle that develops between the three of them. Right away Bankson is drawn to the very things in Nell that Fen feels threatened by/resents; her natural gift and enthusiasm for anthropology, her work ethic in the field, and her desire to discuss her work with someone else. For the first time in a long while he believes in his work again. He revels in their conversations and their time together. Nell, in turn, is drawn to his interest in her and her work. He is kind and wants to listen to what she has to say. Nell and Fen had chased away my thoughts of suicide. But what had they left me with? Fierce desires, a great tide of feeling of which I could make little sense, and ache that seemed to have no name but want. I want. Intransitive. No object. It was the opposite of wanting to die. But it was scarcely more bearable. From time to time, as we are reading, we come across Bankson wondering if things might have turned out differently, if… I found myself wondering often what these upcoming events were that Bankson keeps alluding to. What happens? How bad is it that Bankson wishes he could have somehow altered the course of events? If we had not come up with the Grid, had not had that experience together, and if I had not stayed but gone back to the Kiona, would any of the rest have happened? Long after I was finished reading this book, I found myself thinking about it. 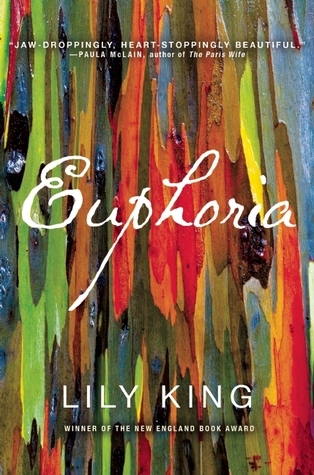 Although it was fiction, Euphoria left me wanting to go back again into the world Lily King created, and to learn more. It made me curious about the real lives of the early anthropologists. What would it have been like? I also wonder about the tribes who are represented in this book. Are any of them still around? This is the first book by Lily King that I have read, but there are others. Has anyone read any of her other books? Any recommendations on other books about anthropology; fiction or non-fiction? For an extensive and entertaining review of this book, see Rick’s at Another Book Blog. This one sounds really good. It seems like the conflict in their marriage and the cultural contributions to that could translate to any of us. Yes, definitely. Which is why I thought the setting and anthropological aspects of the book are what really made it stand out for me. Hmm as a student of Anthropology, I have mixed feelings about someone from outside the “field” re-interpreting the events in her own way. I’ve read part of Mead’s “Coming of Age in Samoa,” and it truly is a hallmark of Anthropology. I’m afraid that a romance novel like this might undo some of Mead’s reputation — after all, according to the review in The New York Times, she chose *not* to publish the book about that period in her life. But it’s a bit hard to tell without actually reading the book myself, I think. I definitely wouldn’t call this a romance novel. In fact, I was happy that it really didn’t need to be the focus of the book, even though it was supposed to be. I got much more out of the book than that. I also have the impression that only the rough idea of the story is based on events in Mead’s life. It actually left me wanting to now the real story. Any suggestions for a good biography of Margaret Mead? If you do end up reading this book, I would be interested in hearing your thoughts as someone who studied Anthropology. I only took one intro course many years ago. I don’t, actually! In the Anthropology classes I took, the focus was very much on primary texts, so I never even heard a biography being discussed. You might just go ahead and read “Coming of Age in Samoa.” It’s surprisingly accessible! I’m glad to hear that the romance didn’t overshadow the book’s historical elements. This sounds fascinating. I also appreciate books that make you want to delve deeper into the actual history behind the work of fiction. I have not read anything about Margaret Mead either…I hope you get some good recommendations! Me too! Except that I don’t need more books to read. It makes me feel better, though, knowing that I have good recommendations if I suddenly feel the need to know more. It is! And on the short side, too. Oh, I’ve heard of this book…..I’ve studied Margaret Mead and her work in college (I’m an anthropology major), but I don’t know if I’d actually want to read a fictionalized version of her life. Could be interesting….? I will keep it in mind. Thanks. Well sadly I can’t recommend any books about Margaret Mead’s life, unless you like reading textbooks, lol. Maybe try reading one of her books, Growing Up in Samoa. Thanks! I think I will check it out. No problem! It’s an ethnography though, so it’s a bit scholarly and technical. ‘Coming of Age in Samoa’ sorry, lol! I’m dying to read this one. Anything about anthropology gets me, but particularly during that period. I love the anthropology theme, too, and have been wanting to read another one since this one. I had The People in the Trees recommended to me. Have you read that one?